As much as I would love to make ALL of my food from scratch ALL the time, it’s just not always realistic while working full-time and juggling kids. I do my best to prepare ahead of time by making a salad bar in our fridge and having ingredients on hand for Make-Ahead Roasted Vegetable Quinoa Bowls or Vegan Quinoa Lunch Bowls. I’ll also try to make lots of things in the Instant Pot, like my Instant Pot Curried Butternut Squash Soup or Vegan Sweet Potato & Lentil Curry. However, some weeks are better than others, and we’re all human and rely on a few convenience foods sometimes. 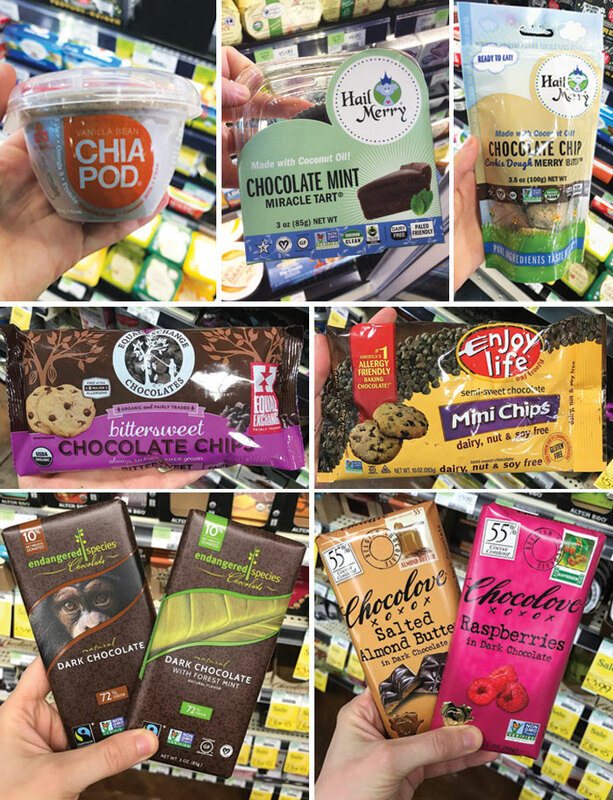 So, I thought I’d share some clean options I found on a recent trip to Whole Foods. I hope they might be convenient for you when you’re rushed for time, too! Julian Bakery Paleo Bread. This grain-free bread isn’t cheap, but it’s an easily available paleo bread for those who must avoid grains entirely. Made with almond flour, coconut flour, and eggs, this bread is typically sold in the freezer section. Alvarado Street Bakery. 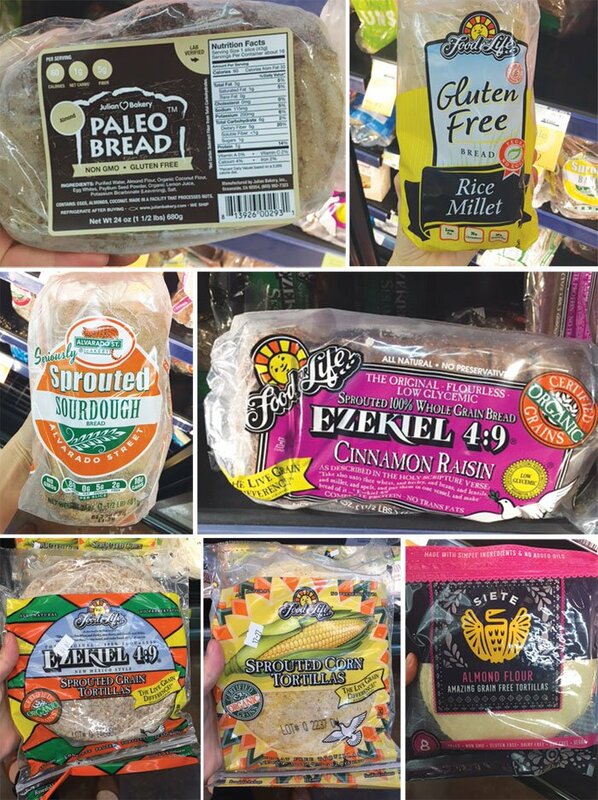 This brand offers a variety of sprouted breads, some that are flourless & vegan, too. Please note that this bread does contain gluten, but I find that it’s easier to digest when sprouted. Food For Life Sprouted Corn Tortillas. These tortillas are naturally gluten-free and because they are sprouted, I find that they are easier to digest. Warm them up gently in a skillet to make them pliable for tacos. These are also found in the same chilled section as the other tortillas. Siete Almond Flour Grain Free Tortillas. These grain-free tortillas are perfect if you need to avoid grains and corn entirely. They also sell a cassava flour + coconut version if you need to avoid nuts– both are available in the freezer section at Whole Foods. Alive & Radiant Kale Chips. 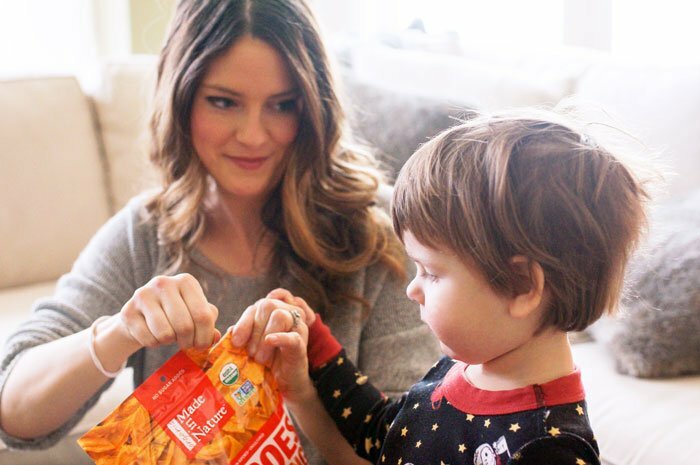 I can’t remember the last time I took the time to make my own kale chips, so this brand is a nice alternative if you want a crunchy green snack. It’s organic, gluten-free and dairy-free, and comes in fun “cheezy” and “ranch” flavors. Gimme Organic Roasted Seaweed. I have to admit, that I’m not a huge seaweed fan, but I know these salty sheets satisfy the “salt craving” for some people. Plus, sea vegetables are high in minerals like iodine, calcium, and iron. The main way I’ve enjoyed these is by adding them as a salad topping, but every now and then I’ll offer them to my son as a snack, too. Go-Go Squeeze Organic Applesauce. Applesauce is one of those things that is so easy to make at home, that I kick myself when I don’t have some on hand. In those moments, I’ll have one of these organic applesauces in my bag to give my son. (The cinnamon and strawberry flavors are his favorite at the moment, and he used to really love the mango, too.) On a side note, we can often find the variety pack at Costco if you’re a member there! Terra Plantain Chips. These are the best plantain chips I’ve ever tasted. They are perfectly thin and crispy, with an even dusting of salt over each chip. I love that they’re cooked in coconut oil, too! Made in Nature Dried Fruit. I love that Made in Nature’s dried fruits are always organic and unsweetened. When they do sweeten their other snacks (like their addictive coconut chips) they use pure maple syrup. Malk Organic Almond Milk. While it’s pretty easy to make your own almond milk, this brand is the closest there is to homemade. The Unsweet flavor is made with only raw almonds (from Spain), filtered water, and himalayan salt– and you can definitely tell. It’s more watery than other milks, and my son isn’t a fan of it plain, but it’s fine in cereals or smoothies. New Barn Almond Milk. This almond milk is widely available and I love that it doesn’t contain carrageenan like other popular brands do. The original flavor is naturally sweetened with maple syrup. 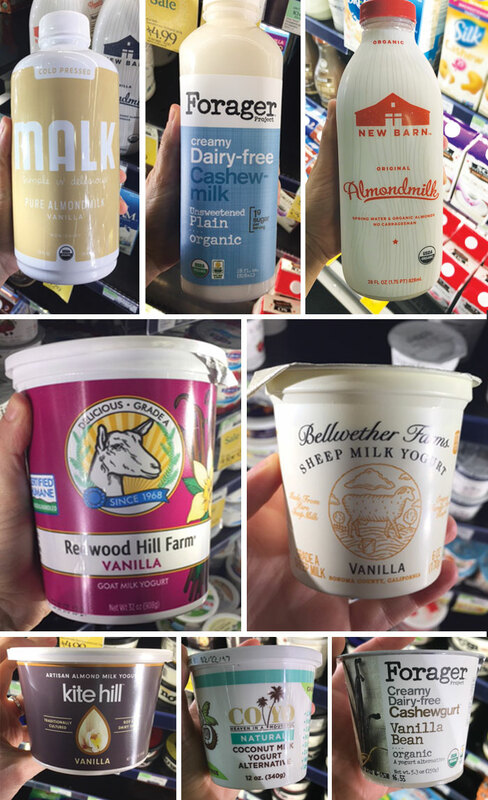 Bellwether Farms Sheep Milk Yogurt. If you prefer the taste of sheep’s milk, this brand of yogurt is relatively easy to find, too. I think it’s slightly more tangy than the goat’s milk yogurt above. Kite Hill Yogurt. This dairy-free yogurt is made from almonds, and is widely available with other dairy-free almond-based products, too. (Like cheese!) I found this yogurt to be a little too sweet, but my son really liked it. CoYo Coconut Milk Yogurt. This dairy-free yogurt has the perfect texture– very similar to Greek yogurt! I also love the simple ingredient list, but if you don’t care for the taste of coconut cream, you won’t like this yogurt– because that’s exactly what it tastes like. Forager Cashewgurt. Texture-wise, you can tell that this yogurt has gums added to it for thickness, but the flavor is good. I think the unsweetened kind would be great with my Pumpkin Seed Granola! 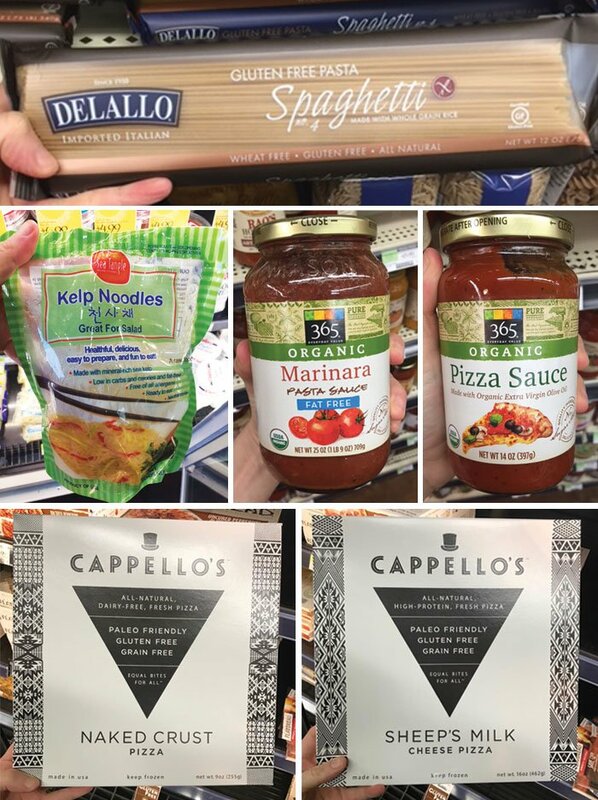 Delallo Gluten-Free Spaghetti. This pasta has a great texture, and the only ingredients are whole grain rice and water. I always keep it on hand in my pantry for nights that I need to throw something together quickly, usually with a bag of frozen veggies, too. Kelp Noodles. I was introduced to kelp noodles back in my raw food days, and they make a great low-carb and grain-free pasta alternative. As another option, I also love to use shredded cabbage, or steamed vegetables as base for pasta sauce, without needing to buy anything exotic. 365 Organic Fat-Free Marinara. I love that this sauce has no added oil or sugar, and it tastes amazing. I could practically eat it with a spoon straight out of the jar. I always keep a couple jars of this on hand in our pantry for quick pasta nights, or to serve over steamed veggies. 365 Organic Pizza Sauce. Another one available only at Whole Foods, this is my go-to pizza sauce. The flavor is perfect, with no added sugar. Chia Pod. If you don’t have time to make your own chia pudding, these chia pods would make an easy grab-on-the-go kind of breakfast or snack. I found them in the chilled section near yogurts. Hail Merry Desserts. These raw treats have been a favorite of mine for years. (The Peppermint Fudge Bars in my first cookbook are inspired by Hail Merry’s Chocolate Mint Tart!) The Chocolate Mint Tart & Dark Chocolate Almond Butter Miracle Tarts are my favorite special treat. Hail Merry’s bite-sized cookie dough/macaroons are a delicious naturally-sweetened option, too. Equal Exchange 70% Dark Chocolate Chips. These chocolate chips are vegan and soy-free, made with fair trade and organic ingredients. Enjoy Life Mini Chocolate Chips. 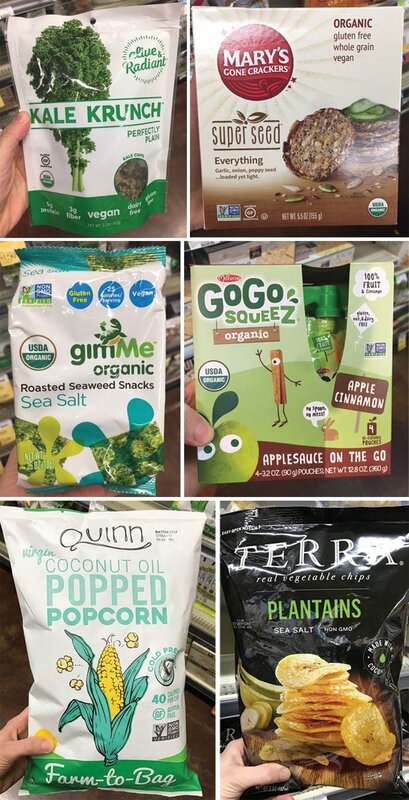 This brand is perfect for people dealing with multiple allergies or special diets, as they are vegan and free of almost all major allergens. They have a darker chocolate chip available, too! Endangered Species Dark Chocolate Bars. There was a point in my life where I would eat half a bar of this chocolate daily– it’s so delicious! The plain 70% and the dark forest mint are my two favorite flavors. Chocolove Chocolate Bars. My art director introduced me to the Raspberry dark chocolate bar during the photoshoot for No Excuses Detox, and I’ve been hooked ever since. Just one square is so satisfying! (Which is unusual for me.) The almond butter-filled dark chocolate is also great, with a nice balance of salt + sweet. Thanks for sharing these great ideas and suggestions. I am fairly new to this ‘healthy eating’ and am following a Paleoish type diet which I love! Some of these may help. Just got your book today. So excited to try out the recipes. Grocery shopping tomorrow, so planning out which ones to try first. My new favorite Whole Foods convenience food is their butternut squash noodles (already spiralized). I can quick sauté up whatever veggies are in the frig with the squash noodles and some marinara sauce. It is delicious and so easy! Many people who preordered your book have received it. I have not received mine yet. I hope it arrives for you soon, too! No offence but why do you need a air poper or to buy popcorn ? You just heat grass fed butter in a pan, when its melted put a handful of corn per person in and put the lid on tossing until poped. Turn the heat off and put the corn in a bowl put the pan straight back on the hob but dont turn back on put in about 1 Tbsp of maple syrup it will bubble, and mix some more butter in and salt stir until caramelised (not long) add the popcorn and stir well. If you are eating straight away thats fine if not put in oven at low temp untill dried out abit either now or before you want to eat. I would go into flavourings apple ect but I am sure you know all this already ? Tastes way better than any shop brought I have ever tried. What a great post! I’ve seen many of these items but hesitate spending the money without a ‘first-hand’ recommendation. Thanks for taking the time to share this valuable information. Hi Megan! My girls are obsessed with the Vanilla Bean Chia Pods (they literally ask for them at every meal) but refuse to eat homemade chia pudding. At $3.60 a pop, that’s obviously not ideal! Do you have a recipe that more closely replicates the chia pods? Ezikiel wraps are also good basted with a bit of olive oil and spices, I use just sea salt & pepper and bake in the oven at 350 for around 10-12 minutes checking often and then simply break into pieces like a cracker. worth a try … really good! The closest Whole Foods is an hour drive from me so I don’t go often. But, the next time I’m there I’m looking for the almond flour tortillas and plantain chips. Thanks so much! I love these kinds of posts!! Hey could you possibly make a paleo apple fritter? Rochester, NY is getting Whole Foods hopefully next year. Can’t wait. Thanks for all you do! Your blog/recipes are #1 in my book!!! I have a big deep freeze (I don’t know now how families can get along without one). But I steam/roast veggies and purée then into silicone muffin tins., then throw it in a freezer bag where I label and date it. So it doesn’t matter what I really make , I can always fortify sauces or breads with extra veggies. I can buy a premade stir fry mix from store. Add in a half cup (or more) sweet potatoes purée to the sauce. Add in some extra frozen veg. And bam. Supper is ready. Or I can buy a premade pizza. (Mushroom and spinach is my favourite) and buy extra mushrooms and onions to throw on top. I can add carrot purée into the eggs of my sons French toast with a bit of cinnamon. Or pumpkin/butternut squash purée into macaroni and cheese. Sweet potatoe mixed with shredded cheese makes THE BEST grilled cheese sandwich because it all oozes together and it’s like your just eating. More cheese. Purees are how I get my family to eat more vegetables. mind you I got most of my ideas from Jessica Simpsons books (my bible. I buy it for everyone). Even if one doesn’t agree with how she cooks nutritionally… she is a master at hiding veggies. And her ideas can be used in almost any other recipe. I loved the wonderful ideas. You have such a great array of choices. Love all these! some of my favorite things! There are so many of my favorites in this list, and what a fun post to share! I’m in love with Food for Life Sprouted Grain bread; they let me enjoy a food I never thought I’d be able to eat again. The cinnamon raisin flavor of their bread is also my favorite! 🙂 I’m also a huge fan of Made in Nature dried fruits. Their figs, raisins, and fruit mixes are great in oatmeal or homemade trail mix. Great list! Thanks for the awesome post…lots of great, healthy stuff here! My family is obsessed with the almond flour tortillas! The mint chocolate Hail Mary might be one of my favorite things ever. I need to try the Coyo next! Such helpful information! I have your first book and ordered your second. Can’t wait for it to arrive! LOVED the post!! thank you! You have amazing ideas, thank you for your time and effort. Lovely post – I love taking wraps for lunch!